What Is a Bathroom Transfer Bench? Transfer Benches are a form of bath/shower bench with a wider seated platform that extends across the top of the tub and to the bathroom floor. By design, a transfer bench combines the function of both a chair for showering with a stool for mobility. An individual can sit onto the edge and maneuver into the bathtub in a seated position instead of first stepping into the bathtub to sit. 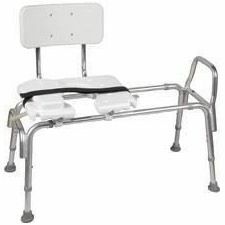 This can make the experience of bathing much easier for those with limited strength and mobility and to help caregivers to position their patients. 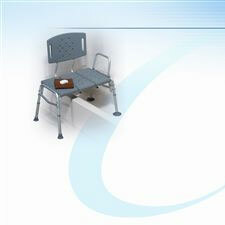 Transfer benches are made out of aluminium and sturdy plastics, just like a standard bath bench. 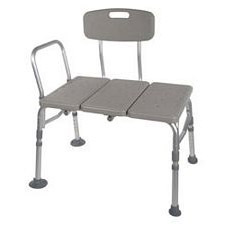 They also have mostly identical features and function to standard bath benches, just with a uniquely different design to further aid with mobility. 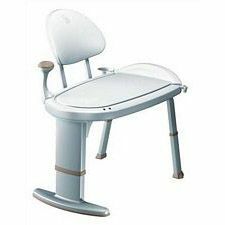 Most bath benches are designed to support between 200 - 300 lbs. There are high-weight capacity versions that support up to 500 lbs. 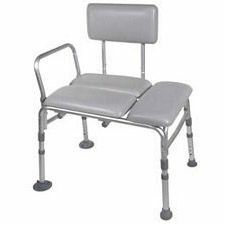 All transfer benches have a combination bench side (with no backrest for maneuverability) and a backrest chair for bathing. 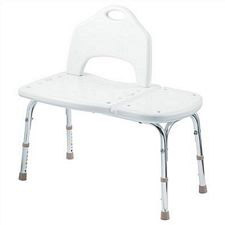 As these benches are designed to go up and over a tub, most if not all include height adjustment pegs on the legs to quickly and easily adjust the height without tools. 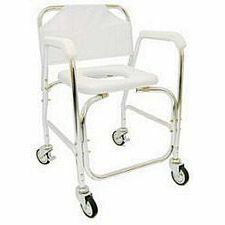 Handles help aid with mobility when getting up and down from the seat. Some bath benches (with or without a backrest) have built-in grips for movement and for comfort. Almost all benches come with some assembly required; for most, the pieces simply snap together and assembly requires no tools. 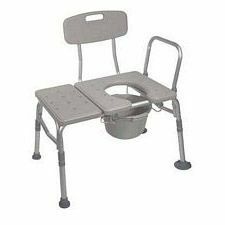 Some bath benches have a commode cut-out in the bottom for convenience and saving space when needed.